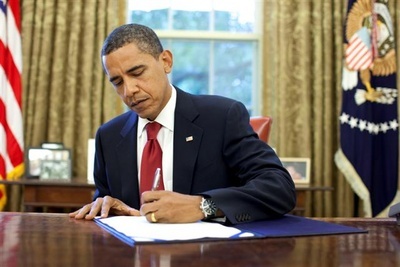 U.S. President Barack Obama Proclaims September 2013 As National Ovarian Cancer Awareness Month — What Should You Know? Yesterday, U.S. President Barack Obama designated September 2013 as National Ovarian Cancer Awareness Month. The Presidential Proclamation is reproduced in full below. During National Ovarian Cancer Awareness Month, Libby’s H*O*P*E*™ will honor the women who have lost their lives to the disease, support those who are currently battling the disease, and celebrate with those who have beaten the disease. This month, medical doctors, research scientists, and ovarian cancer advocates renew their commitment to develop a reliable early screening test, improve current treatments, discover new groundbreaking therapies, and ultimately, defeat the most lethal gynecologic cancer. Statistics. In 2013, the American Cancer Society (ACS) estimates that there will be approximately 22,240 new ovarian cancer cases diagnosed in the U.S. ACS estimates that 14,030 U.S. women will die from the disease, or about 38 women per day or 1-to-2 women every hour. This loss of life is equivalent to 28 Boeing 747 jumbo jet crashes with no survivors — every year. Cancer Facts & Figures 2013. Atlanta: American Cancer Society; 2013 [PDF file]. Presidential Proclamation — National Ovarian Cancer Awareness Month, 2013, Office of the Press Secretary, The White House, August 30, 2013. This entry was posted in Advocacy, Causes, Prevention, Prognosis, Symptoms and tagged Barack Obama, BRCA gene mutations, Early Detection, early warning signs & symptoms, ovarian cancer, Presidential Proclamation, Prevention, Risk Factors. Bookmark the permalink. So encouraging to see more awareness of Ovarian Cancer especially with this September Proclamation. My sister-in-law passed away from Clear Cell Ovarian Cancer in November 2012. On her behalf and in her memory I thank you. Thank you so much Gina for your comment. I am so sorry to hear about the passing of your sister-in-law in November 2012 from the lethal subtype of epithelial ovarian cancer known as “clear cell.” Having lost my 26-year old cousin Libby in July 2008 from the same subtype of ovarian cancer, I share in your feeling of great loss. But, I also feel a sense of optimism about the research progress in the area of ovarian clear cell cancer (OCCC). I work closely with the Doug and Diana Gray Ovarian Clear Cell Carcinoma Research Resource (OCCC Research Resource), an 8-year research project dedicated to fully understanding, and ultimately beating, OCCC. To the best of my knowledge, it is the largest international research project dedicated to a specific subtype of epithelial ovarian cancer. Unfortunately, this research will take time and money. Unfortunately, this research did not save your sister-in-law or my cousin Libby. But, I am convinced that OCCC will ultimately be beaten. In fact, a recent drug known as “ENMD-2076” has shown great promise within a small group of OCCC patients. In addition, there are several additional novel treatment approaches that also show promise. I know that Libby’s H*O*P*E* will keep fighting in the memory of your sister-in-law and Libby, while continuing to help other OCCC survivors and their family members on a one-on-one basis who are in the midst of their fight. Gina, thank you again for the kind words and know that Libby’s H*O*P*E* will not rest until OCCC is beaten in the name of those women whose lives were cut short by this lethal form of ovarian cancer. We will continue to fight and we will keep you and your sister-in-law in our thoughts and prayers. Thank you Mr. President. I am in remission 3 years, 9 months, for this disease. I’d never heard of it until I was diagnosed. This means a lot to us women who fight it. Teresa, I simply want to thank you for posting your comment. Congrats on the nearly 4 year period of remission. So many of the ovarian cancer survivors that we communicate with also never heard about the disease until initial diagnosis. I would encourage you to find your “own voice” as an ovarian cancer advocate in this fight, if you have not already done so. It is important for our readers to understand that the U.S. Government funds almost 90% of all ovarian cancer research conducted in the U.S. The National Cancer Institute (NCI) funds almost $100 million of ovarian cancer research per year. The Department of Defense has funded between $10 million and $30 million of ovarian cancer research per year for the past 12 years. The Ovarian Cancer National Alliance has done an excellent job of protecting, while always fighting to increase, this critical research funding on behalf of ovarian cancer survivors and their family members. Thank you again for stopping by, and please do so again in the near future. I wish you all the best during National Ovarian Awareness Cancer Awareness Month and beyond.